I know the vacations of other people are not particularly interesting, but please indulge me just one more post before I return to the usual church IT theme of this blog. After Big Bend, we proceeded to San Antonio. 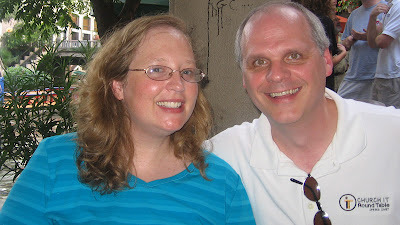 My son took this picture of Laura and me eating dinner at Casa Rio on the famous San Antonio River Walk. Note the shirt I’m wearing! 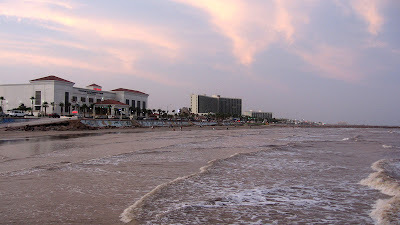 From San Antonio, we continued to Galveston, the Gulf of Mexico island community south of Houston at the mouth of Galveston Bay. I took this picture of the beachfront just a block from our motel. On the way home we stopped at the Oklahoma City National Memorial. 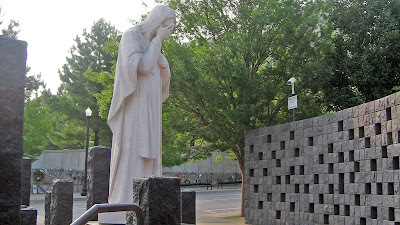 Laura took this picture of a statue outside the Catholic church immediately across the street from the site of the destroyed Murrah building. The statue is of a crying Jesus with his back to the site. So that was our Texas sampler vacation: 3700 miles from Kansas City, via Little Rock to Fort Worth, Big Bend, San Antonio, Galveston, and back home via Oklahoma City. Texas is a HUGE state with an AMAZING variety of cultures and vistas. It’s a great vacation destination because it has something for everyone: major cities, remote mountains, the ocean, and Tex-Mex food everywhere! I will be back in the office on Monday after three weeks away. I must admit, I’m not looking forward to it. Vacation is more fun than work!